BANFF, ALBERTA, Canada – Experience the breathtaking beauty of the Canadian Rockies while enjoying one of the region’s most traditional activities. Let Snowy owl Sled Dog Tours take you on a wild adventure in Banff National Park. Our all-inclusive dog sled tours are world class. Need transportation from your hotel in Banff? We offer scenic round trip transfers from Banff and Canmore, Alberta in our cozy, heated 2011 Mercedes Sprinter vans. Upon arriving at our launch site in Banff National Park, you’ll receive an informative 30-minute chat introducing you to the exciting world of dog sledding. Our highly trained instructors know the importance of safety and are certified in First Aid, CPR and emergency response. All of our beautiful handcrafted sleds are fully designed with your comfort in mind. Each sled includes Pendleton wool blankets, wind and water-resistant sled bags and luxurious four-inch upholstery. Safety is our game at Snowy Owl Sled dog Tours, and we never overload our sleds. 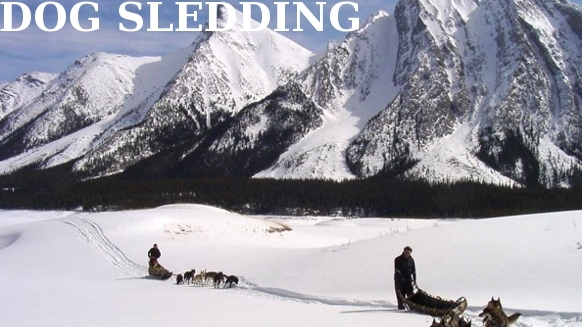 Having a maximum of three adults per sled ensures your safety and comfort, as well as that of our hardworking dogs. Depending on your mushing experience and level of comfort leading a team of Canadian huskies through the wilderness, we offer a range of options. -First, you can just sit back and relax, as your experienced instructor takes you for an unforgettable ride. No experience necessary! -Second, you lead your own dog team, with an instructor by your side giving you helpful tips and guiding your decisions. -Third, drive your very own team of dogs with a knowledgeable instructor following closely behind to give you pointers and respond in case of emergency. Bring your friends and family along for the ride. For many travelers the best part of a Canadian Rockies dog sledding experience is the camaraderie that develops between the riders, instructors and dogs. On our Banff dog sledding tours, we’ll provide you with tasty hot beverages and snacks as we cozy up next to the campfire. Be sure to try our Native Canadian Campfire Lunch available on extended programs. We will do our best to accommodate any dietary requirements among your group members. Dog lovers should not miss this incredible opportunity to interact with our adorable, well groomed and charismatic purebred huskies. We treat our dogs with the love and respect they deserve, making for a positive Canadian Rockies experience for everyone who joins our tours. -We offer top quality North Face Expedition gear and Glacier Sorel boots upon request. All of our rental equipment is up-to-date according to the latest technologies and safety standards. -Snowy Owl Sled Dog Tours also provide a professional on-site photographer so you can share your experience with friends and family. Photos are available for purchase at the end of your trip. -Be sure to visit our gift shop during check in and check out and bring a piece of your Banff dog sledding experience home with you. We offer a wide range of souvenirs, winter apparel, DVDs and more.